This panel originally had an arched top and included a more open landscape with less leafy trees. At an unknown date the work must have suffered damage that affected the pictorial surface, resulting in losses to the figure of Saint Anthony and the background. Possibly as a result of this, the surface was restored and some areas repainted. 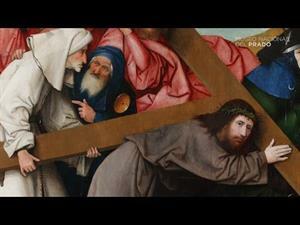 The most recent analyses undertaken by the Prado’s Technical Documentation Department and Laboratory confirm that the technique of this re-painting (which is visually distinguishable from Bosch’s original brushwork) is similar to the artist’s and was probably carried out in Flanders. Subsequently, in the nineteenth century, the work was changed to a rectangular format through the addition of pieces of oak at the corners. At that time the landscape was enlarged, thus altering still further the work’s appearance. Actually these additions have been covered over and the original arch-topped format can thus be appreciated. 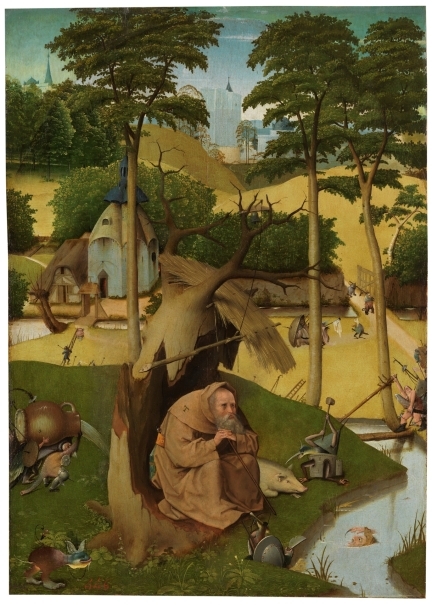 In contrast to his other depictions of the saint, and in an extremely original manner, Bosch shows him here absorbed in his thoughts among the wilds of nature, which is evoked by the brilliantly depicted hollow tree trunk that shelters him. Anthony is not even holding his book, which is closed and hangs from his belt. Nothing distracts him from his inner concentration, and this is also true for his attribute, the pig with a bell on its ear lying at his feet and oblivious to the assault of the devil that is about to hit it with a mallet. 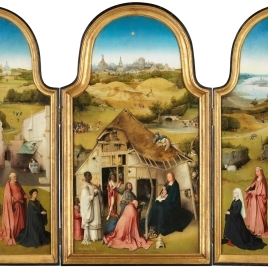 To maintain the unity of space and time Bosch only represents Anthony once, in the centre of the composition and on a reduced scale in relation to the landscape, which he expands by using a high horizon line. 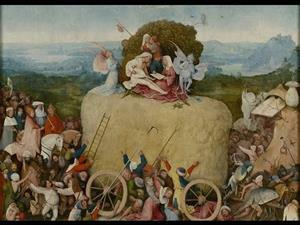 Another original feature of this work is the fact that Bosch does not show the devils as attacking the saint. Rather, they are scattered across the area enclosed by the wall on the right, as if preparing to launch their attack, carrying ladders or concealing themselves behind the grassy mounds or the shield. The confrontation has yet to take place, as is most clearly indicated by the fire that has started in the chapel, its glow barely visible through the doorway and behind the building. Also worth mentioning are the devils pouring water on a fire which has broken out on the rear side of the tree that shelters the saint. The fire was not visible prior to the restoration and can now only be discerned from the sparks and smoke. It undoubtedly refers to Saint Anthony’s fire. 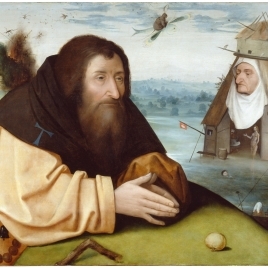 The technique employed in The Temptations of Saint Anthony is similar to that found in other autograph works by the artist. Over a chalk ground with an animal glue binder Bosch applied a thin layer of pale grey priming. 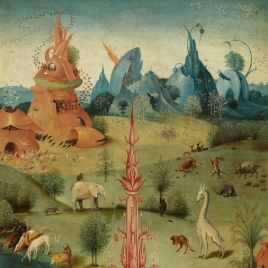 The pigments employed are those traditionally used by fifteenth-century Flemish painters, including Bosch, who applies them here in very thin layers and generally a single one, as was habitual with his technique, although more are to be found in some areas that have superimposed layers and re-painting. As is habitual with the artist, they are constructed from forms and objects taken from everyday life which he copies literally, for example the funnel (a regular motif in his work) of the devil with the bird’s head that is about to take the saint’s pig unawares. Furthermore, the actual painting of these creatures is wholly compatible with Bosch’s own hand. 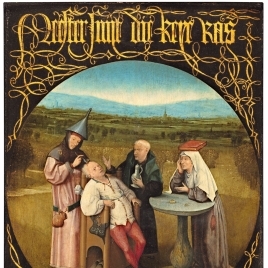 For example, the small monster in the left corner, which seems to be licking its lips as it prepares to attack the saint (like the bear about to eat the man it is attacking in The Adoration of the Magi in the Prado, has the same highlights, impasto and regular dots in relief to be found in Bosch’s other works. The same could be said of the knife held by another devil, which is emphasized to the extent that it could have some specific meaning. The support consists of two pieces of Baltic oak. As noted above, the dendrochronological tests undertaken by Peter Klein confirm that the wood could have been used from 1462 onwards and most probably from 1464. While in general it has been considered that the work must date from the second decade of the sixteenth century, during the final years of Bosch’s life before his death in 1516, there is no reason, including no aesthetic reason, to put the date back as far as 1530-40. While this underdrawing is not particularly abundant and is in general limited to the outlines, it can be seen on the saint and areas near to him, particularly where the artist made changes, both during the drawing phase and the final painting phase. A good example is the branch supporting the front part of the straw roof in the tree, which was originally higher up and set at a more oblique angle. Free, rapid strokes are also found in the underdrawing defining the lower part of the hollow in the tree trunk. With regard to the underdrawing of the saint, the most significant is perhaps the correction of the shape and size of his nose, which is not so long in the underdrawing. 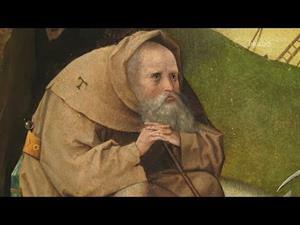 Despite the problems that have affected the pictorial layers, in much of the figure of Anthony it is possible to appreciate how Bosch reinforced the shading lines beneath the saint’s right arm resting on his knee or how he depicts the beard, which is notably similar to the beard in the fragment of The Temptations of Saint Anthony in Kansas, painted by Bosch around the same date. 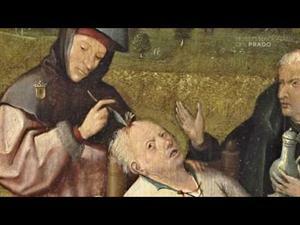 As on other occasions, Bosch made changes during the painting stage. Far more significant are the changes to the two buildings on the left. The tau-shaped cross on top of the thatched entrance leading from the bridge identifies these buildings as the saint’s home and chapel. As is apparent from the X-radiograph, early on in the painting stage Bosch made the roof of the house (which he depicts as a typical Brabant farmhouse, like the structure housing the manger in The Adoration of the Magi in the Prado, P02048) larger, flatter and more sloping. This roof initially extended further back and covered the rear part of the house that now appears on the pictorial surface. 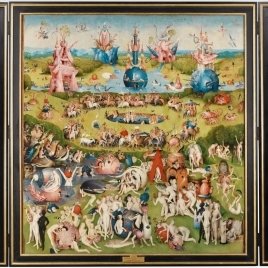 The painting’s technique reveals devices characteristic of Bosch, such as reservation of space for the principal elements in the scene or the unprepared painting of other elements over an already painted surface. A clear example of the latter is the body of the devil in the lower left corner, which has become transparent and now shows the grass underneath it. Other elements that might seem less important were conceived from the outset, such as the bridge formed from a treetrunk spanning the water on the far right. Bosch painted this directly on the surface, conveying all its details, texture and highlights, and the same can be said of the tremulous movement of the water, and the nearby devils and the objects they are carrying or which are part of their bodies. All these devices are extremely characteristic of Bosch, as is the manner of executing the outlines of the forms on the surface, either light or dark depending on whether they are located on the left side, from which the light falls, or in the shadow on the right (Text drawn from Silva, P.: Bosch. 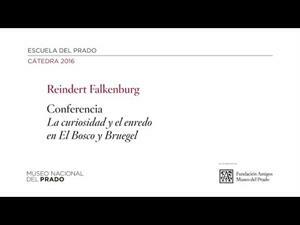 The 5th Centenary Exhibition, Museo Nacional del Prado, 2016, pp. 251-257). Height: 73 cm. ; Width: 52.5 cm. Juan de Benavides, Marquis of Cortes (d. 1563), prior to 1563; purchased at his posthumous sale by Philip II; sent by Philip II to the monastery of San Lorenzo de El Escorial on 8 May 1572; in El Escorial until moved to the Museo del Prado in 1839. Ponz, Antonio, Viage de España. Vol. I, Joachin Ibarra, Madrid, 1773, pp. 106. Brans, J.V.L., Hieronymus Bosch (El Bosco) en el Prado y en el Escorial, Omega, Barcelona, 1948, pp. 50/ lám.75. Delevoy, Robert L., Bosch, Skira, Ginebra, 1960, pp. 126. Mateo Gómez, Isabel, El Bosco en España, Instituto Diego Velázquez, del C.S.I.C., Madrid, 1965, pp. 25/ lám.38. De Tolnay, Charles, Hieronymus Bosch, Reynal and Company William Morrow and Company, Baden-Baden, 1965, pp. 306,373. Boon, K.G., Jheronimus Bosch, Hieronymus Bosch Exhibition Foundat, Hertongenbosch, 1967. Friedländer, Max J., Tout L'Oeuvre Peint de Jerome Bosch, Flammarion, Paris, 1967, pp. 57. Friedländer, Max J., Early netherlandish painting, V, A.W.Sijthoff, Leyden-Bruselas, 1969, pp. lám.83. Reutersward, Patrik, Hieronymus Bosch, Rudolf Zeidter, Upsala, 1970, pp. 253. 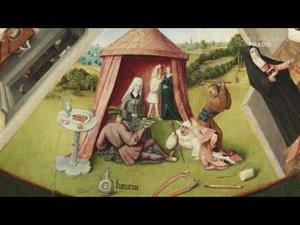 Boczkowska, Anna, Hieronim Bosch, Arkady. Henschelverlag, Varsovia. Berlin, 1974, pp. 44. Schuder, Rosemarie, Hieronymus Bosch, Union Verlag, Berlin, 1975, pp. lám.35. Bermejo, Elisa, La pintura de los primitivos flamencos en España, C.S.I.C., Instituto Diego Velázquez, Madrid, 1980, pp. 116. 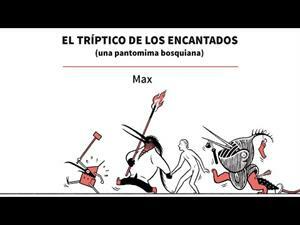 Bango Torviso, Isidro, Bosch: realidad, símbolo y fantasía, Silex, Vitoria, 1982, pp. 205. Dixon, Laurinda, Bosch's St. Anthony triptych an Apothecary's Apotheosis, Art Journal, 1984, pp. 119-131/ lám.22. 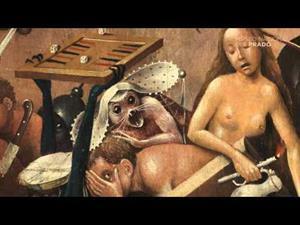 Marijnissen, Roger H., Hieronymus Bosch. The Complete Works, Tabard Press, Amberes, 1987, pp. 436. Linfert, Carl, Hieronymus Bosch, Harry N.AbramsInc., Nueva York, 1988, pp. 132-134. Checa Cremades, Fernando, Felipe II: mecenas de las artes, Nerea, Madrid, 1992, pp. 161,175, 236, 249, 302, 408, 421. Marijnissen, Roger H., Bosch, Electa, Milano, 1995, pp. 125. 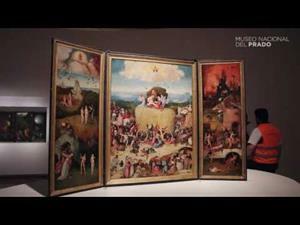 Garrido Pérez, Carmen, El Bosco en el Museo del Prado. Estudio Técnico, Museo del Prado, Madrid, 2001, pp. 59. 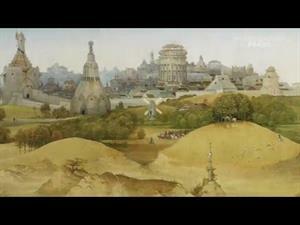 Koldeweij, Jos, Hieronymus Bosch. New Insights Into His Life and Work, Nai Publishers, Rotterdam / Ludion Gen, 2001. Museo Nacional del Prado, Pintura flamenca de los siglos XV y XVI: guía, Museo del Prado, Madrid, 2001, pp. 174. The World of Bosch, Heine Uitgevers, Hertogenbosch, 2001, pp. 103. Elsig, Frédéric, Jheronimus Bosch. La question de la chronologie, Droz, Genève, 2004, pp. 133-135 fg.81. 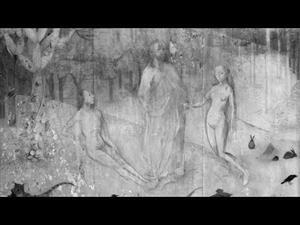 Fraenger, Wilhelm, Hieronymus Bosch: le tentazioni di Sant'Antonio /, Abscondita,, 2007, pp. 111-124. Marijnissen, Roger H., Jérôme Bosch : Tout l' oeuvre peint et dessiné, Mercatorfonds, 2007, pp. 436. Schrecken und Lust. Die Versuchung des heiligen Antonius von..., Hirmer, Múnich, 2008, pp. 20. 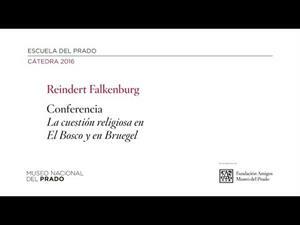 Pérez de Tudela, Almudena, 'Acceptance of Bosch's works by courtiers during the reing of Philip II: new examples' En:, Jheronimus Bosch, his patrons and his public . 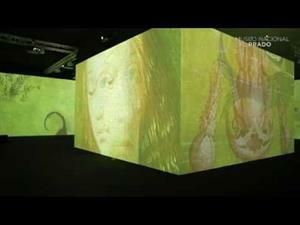 International Jheronimus Bosch Conference (3trd) 16-18 september 2012. 's-Hertogenbosch, 2014, pp. 190-205 . 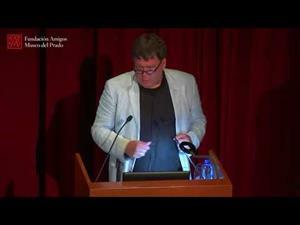 Santos Bueso, Enrique, Oftalmología en el Museo del Prado, Gertograf, 2015, pp. 64. 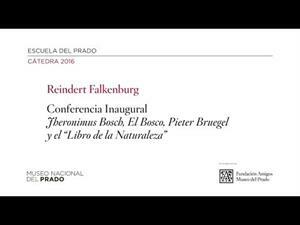 Vanderbroeck, Paul, 'Axiologia e ideologia en el Bosco' En:, El Bosco. 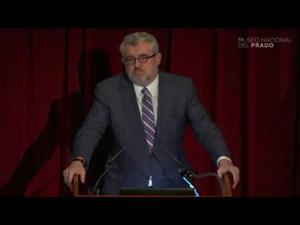 La exposición del V Centenario, Museo Nacional del Prado, 2016, pp. 91-113 [101-102 f.VI.12]. Silva, Pilar, 'El Bosco. Las tentaciones de San Antonio Abad' En:, El Bosco. La exposición del V Centenario, Museo Nacional del Prado, Madrid, 2016, pp. n.26 251-257. 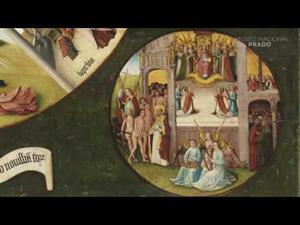 BRCP, Hieronymus Bosch. Painter and draughtsman, technical studies., Mercatorfonds ; Yale University Press,, 2016, pp. n.31 412-413,455. Hieronymus Bosch: Visions of Genius, Mercatorfonds: Noordbrabants Museum te´s-Hertogen..., 2016, pp. 154 n.46. Bosch Research and Conservation Project, Jérôme Bosch. Peintre et dessinateur. Catalogue raisonné, Actes sud,, 2016, pp. 456-459 n.31. Schwartz, Gary, Jheronimus Bosch: the road to heaven and hell, Overlook Duckworth,, 2016, pp. 146-147. Ilsink, M Koldeweij, J, 'Navolger Jheronimus Bosch. 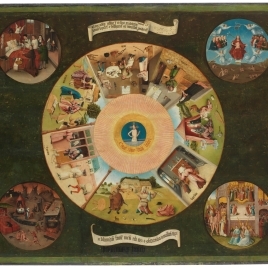 Antonius' En:, Jheronimus Bosch : Visioenen van een genie, Mercatorfonds: Noordbrabants Museum te´s-Hertogen..., 2016, pp. 154-155 n.46. Catálogo Museo del Prado, 1854-1858. Núm. 446. Inv. Real Museo, 1857. Núm. 446. 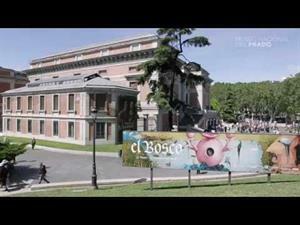 Bosch. / 446. Las tentaciones de San Antonio (E.) (tabla.) / Alto 2 pies, 6 pulg; ancho 1 pie, 10 pulg. Catálogo Museo del Prado, 1872-1907. Núm. 1176. Catálogo Museo del Prado, 1910. Núm. 2049. Catálogo Museo del Prado, 1942-1996. Núm. 2049.